PLEASE NOTE THAT USING OUR ADDRESS IN GPS MAY NOT WORK! Take Route 23 approximately 7 miles north of the town of Sussex, NJ or 4 miles south of Port Jervis, NY. Both the park office and the main entrance to the park on located on Route 23. Take Route 23 approximately 7 miles north of the town of Sussex, NJ, or 4 miles south of Port Jervis, NY. The view from High Point Monument, at 1,803 feet above sea level, is a spectacular panorama of rich farmland and forest, soft hills and lush valleys in three states. The blue line of the Delaware River divides the verdant ridges of New Jersey from those of Pennsylvania. 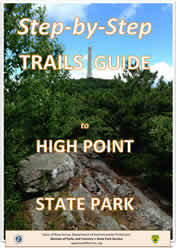 High Point offers superb trails for hikers and skiers and quiet spots for campers and anglers. The land for High Point State Park, donated by Colonel Anthony R. and Susie Dryden Kuser, was dedicated as a park in 1923. The pleasant landscaping was designed by the Olmsted Brothers of Boston, a prominent landscape architectural firm of that time. The brothers were the sons of the eminent Frederick Law Olmsted, who designed Central Park. High Point State Park facilities are partially accessible for persons with disabilities. Please contact the park office for further information regarding disability access needs. Text telephone (TT) users, call the New Jersey Relay Service at (800) 852-7899. Access to the base of the monument is currently restricted however you can visit the area surrounding the monument any time the park is open. There will be no vehicle access to the monument on Saturday April 27 until approximately 1:30 pm due to a bike race taking place in the park. Extended weekend hours Memorial Day weekend through October 31 as staffing permits. The monument was built through the generosity of the Kusers, in honor of all war veterans. Construction was started in 1928 and completed in 1930. 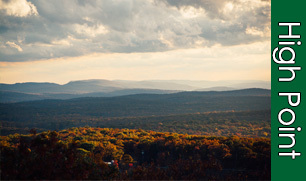 At the top of the 220-foot structure, observers have a breathtaking view of the ridges of the Pocono Mountains toward the west, the Catskill Mountains to the north and the Wallkill River Valley in the southeast. Monument: You can access the location of the monument during regular park hours (weather permitting in the winter due to road conditions). If you would like to enter the monument with the option to climb to the top it is open on weekends and holidays from Memorial Day weekend until June 24 from 8:30 a.m. to 4 p.m. (staff permitting). Open every day from 8:30 a.m. to 4 p.m. from June 24 through Labor Day (staff permitting). Open weekends and holidays after Labor Day until Columbus Day (staff and weather permitting) from 9:15 a.m. to 4:45 p.m.
August 18th-31st: Open Weekends from 1pm - 4pm 8/18, 8/19, 8/26, 8/26. Closed Weekdays. After Labor Day - Columbus Day: Open Weekends from 9:15 - 4:45 pm. Closed Weekdays. You can always visit the building without accessing the interior when the park is open from 8am to 8pm. The park offers a variety of interpretive and educational programs on a year-round basis. Nature hikes, stream walks and talks are conducted by the park naturalist. Please contact the park office for additional program information and to register. Program fees may apply. The spring-fed waters of the 20-acre Lake Marcia are cool and refreshing for swimmers. Swimming is permitted in the designated swimming area while lifeguards are on duty. Please check our swimming schedule prior to your visit. There is a bathhouse and food concession adjacent to the beach. Inner tubes, rafts and other flotation devices are not permitted in the swimming area. Only Coast Guard approved life jackets are permitted. Pets are prohibited on the beach. Boats may be launched at specific locations at Sawmill Lake and Steenykill Lake. Boating is permitted subject to New Jersey's boating regulations and NJ State Park Service rules. Check with the park office for launch sites. Coast Guard approved personal flotation devices are required for each boat occupant. Power boats are limited to electric motors only. Excellent fishing can be found in High Point's lakes and streams, which are well-stocked with trout, large mouth bass and other species. Please refer to Division of Fish and Wildlife regulations. THE ZONE 67 MUZZLELOADER HUNT IS SCHEDULED TO TAKE PLACE IN 2018 FROM NOVEMBER 5-8 AND 12-15. HUNTING IS NOT PERMITTED ON NOVEMBER 9. THIS DATE WAS LISTED WRONG IN THE COMPENDIUM. Each November High Point State Park allows hunters to participate in a special deer hunt in a designated area of the park (Deer Management Zone 67). To participate, hunters must purchase a Zone 67 permit from a license agent or via the Division of Fish & Wildlife’s Internet license sales site. The 850-acre Dryden Kuser Natural Area, dedicated in 1965, was the first Natural Area in the State of New Jersey. It is named for State Senator Dryden Kuser, a noted conservationist and son of Anthony and Susie Dryden Kuser, who donated the land that became High Point State Park in 1923. Dryden Kuser also served on the High Point Park Commission and lived on Park grounds for several years near the end of his life. An accomplished bird watcher, the bog was one of his favorite places at High Point. At 1,500 feet above sea level, the Atlantic white cedar swamp in Dryden Kuser Natural Area is the highest elevation swamp of its kind in the world. 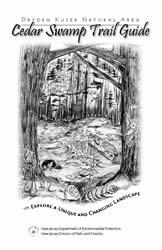 A self-guided trail booklet for those who wish to hike the swamp trail is available at the park office, or can be found below. Endangered species include the three-tooth cinquefoil and Cooper's hawk. With over 50 miles of trails, High Point State Park offers visitors a variety of trail options throughout the year, Designated multiple-use trails are available for hiking, mountain biking, horseback riding, cross country skiing, snowshoeing, dogsledding and snowmobiling. Trails vary in length from one half-mile to 18 miles and take visitors through unique and diverse landscapes including an Atlantic white cedar swamp, mountain ridge tops with 360-degree views, dense forests, fields and wetlands. The Appalachian Trail is open to foot travel only (including snowshoeing) at all times and a trail pass is never required. See attached "Winter Activities Map" for more information. 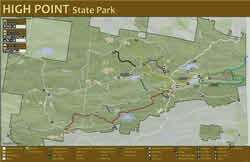 18 miles of the Appalachian Trail follows the Kittatinny Mountain Ridge through High Point State Park. This trail's designated use is restricted to hiking only for its entire length from Maine to Georgia. White blazes mark this narrow and sometimes very rocky trail. To the south, the Appalachian Trail follows a rocky ridge which offers many scenic views of the valleys and mountains surrounding the area. To the north, the trail drops off the ridge through hemlock gorges into former agricultural fields with a view of the surrounding countryside and the High Point Monument in the distance. There are 3 designated overnight shelters: Mashipacong shelter, Rutherford shelter and High Point shelter. These are the only overnight locations that allow you to stay overnight on the trail. Camping is limited to 1 night per shelter. Limited water sources can be found via a stream at High Point Shelter, or at the park office. You should plan to carry sufficient water for your hike as water along the trail may not be suitable for consumption. All water obtained along the trail should be chemically treated or boiled for 5 minutes. No motor vehicles of any kind are permitted on AT. The Appalachian Trail is for foot travel only. Overnight parking is located at the Appalachian Trail Parking Lot on Route 23 just South of the Park Office. A permit is required and can be obtained during Park Office business hours. This is the only designated overnight parking for the AT in High Point State Park. The Dryden Kuser Natural Area includes a distinctive bog, locally called the Cedar Swamp. The Cedar Swamp Trail makes a one and a half mile loop around the bog. The trail guide described the spring-summer vegetation and other features of the bog and the surrounding area. The descriptions in the guide correspond to numbered posts on the trail. As you enjoy the natural beauty of this area, please remember to leave it undisturbed for future visitors. Winter months find cross-country skiers on the 15 km of groomed trails in the park. Cross-country skis and other winter sports equipment are available for rent. A blazing fire, hot soup and other hearty food greet visitors at the center on Lake Marcia. For information, call (973) 702-1222; www.xcskihighpoint.com. Campsites: 50 tent sites (no trailers) along Sawmill Lake with fire rings and picnic tables. Flush toilets are within walking distance. Open April 1 through October 31. Fee: NJ Resident $20 per night; Non Resident $25 per night. Group campsites: Two group campsites with drinking water and pit toilets. Each campsite accommodates up to 25 people. Open year round. During the winter months visitors must bring in their own water or obtain it at the park office. Fee: NJ Resident $50 per night; Non Resident $100 per night. Cabins: Two cabins each with furnished living room with a woodstove; three bedrooms -one room with double bed, two rooms with twin beds; kitchen with hot and cold running water, electric stove, refrigerator; bathroom with shower, toilet, and sink. Electricity. Cabins are located on eastern shore of Steenykill Lake. Each accommodates six people. With prior permission from the superintendent, two additional people may be accommodated. Cabins are open from May 15 to October 15. Fee: NJ Resident $75 per night; 525 per week; Non Resident $85 per night; $595 per week. Group cabin: Living room with woodstove, full kitchen, two bunkrooms with double bunks, bathrooms, showers. Accommodates up to 28 people. Open May 15 to October 15. Fee: NJ Resident $175 per night; Two-night minimum; Non Resident $185 per night; Two-night minimum. • Lusscroft Farm - Heritage & Agriculture Association, Inc.
What interpretive programs are offered? Please call the Interpretive Center directly at (973) 875-1471 for schedules and information.